It was a case of One-77 meets 007. 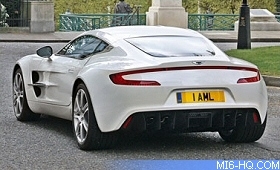 The most exclusive Aston Martin ever rolled into James Bond HQ - at Dalton Square in central London, reports The Sun. It was the first time the supercar has been seen on UK roads. The One-77 - which will cost an eye-watering Â£1.2million - left punters shaken and stirred when it took part in a supercar run from London to Silverstone. The run was designed to promote the inaugural FIA GT1 World Championship. The One-77, which is the first production-ready example made by Aston, may become Bond's car when Daniel Craig appears in the next flick. 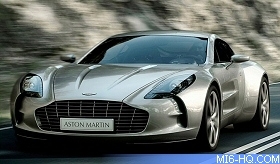 The Aston One-77 is powered by a 7-litre V12 engine, which produces around 700bhp. In testing, the One-77 has already become the fastest Aston ever, recording more than 220mph. Only 77 will be built and 50 have already been bought - before any member of the public has even driven one. Aston expect to sell the other 27 fairly quickly - even though the deposit alone is Â£200,000 - the cost of an entire Ferrari F430 Spider! 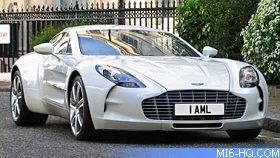 The first deliveries of One-77s will be in the autumn.